DEKALB COUNTY, Ga. -- A restaurant employee was shot in the leg during a robbery Monday night. DeKalb County Police said China Star in the 3500 block of Chamblee Tucker Road was robbed by a single gunman. The suspect entered the restaurant and demanded money from the cash register. He then shot a male employee in the calf, grabbed cash and ran from the building. The 57-year-old employee was taken to Grady Memorial Hospital with a moderate injury. He is expected to survive. Witnesses described the suspect as a black man in his 20's, about 5 feet 9 inches tall, with a slim build and light complexion. No arrests have been made. The robbery is under investigation. DEKALB COUNTY, Ga. -- Two people were shot, one fatally, at a DeKalb County motel Friday morning. It happened just after 5 a.m. at the Stone Mountain Inn & Suites in the 1800 block of Mountain Industrial Boulevard. Witnesses told police they heard three gunshots and then saw four men run from the motel. DeKalb County Police Capt. Steven Fore said a 24-year-old man was shot in the neck. He was taken to Atlanta Medical Center, where he was later pronounced dead. An 18-year-old victim was shot in the leg. He was treated at Atlanta Medical Center. Fore said the surviving victim is not cooperating with the investigation. Police have not yet determined a motive for the shooting or named any suspects. The investigation continues. UPDATE: Officials said David Macintyre has been found. ATLANTA – Family members are concerned about a 77-year-old man last seen on Wednesday afternoon. David Macintyre, who suffers from late stages of Alzheimer's, has been without his medication for more than 24 hours, family members say. Macintyre was last seen at his home on 2403 Northlake Court NE in Atlanta. His wife told police that she went to sleep around 1 p.m. on Wednesday. When she woke up, her husband had left without telling her where he was headed. Macintrye is about 6 feet tall was last seen wearing a plaid sport coat, dark blue pants and a grey sweatshirt. He is driving a silver Mercury Grand Marquis LS with Georgia tag AFQ9474. Anyone who sees him is asked to call the DeKalb County Police Department at (770) 724-7841. TUCKER, Ga. -- Imagine being afraid to have your children play in front of your townhome, or having to watch from your front window as trash and furniture are being discarded right in front of you. That is what happened at one residential complex in Tucker until 11Alive's Help Desk got involved. 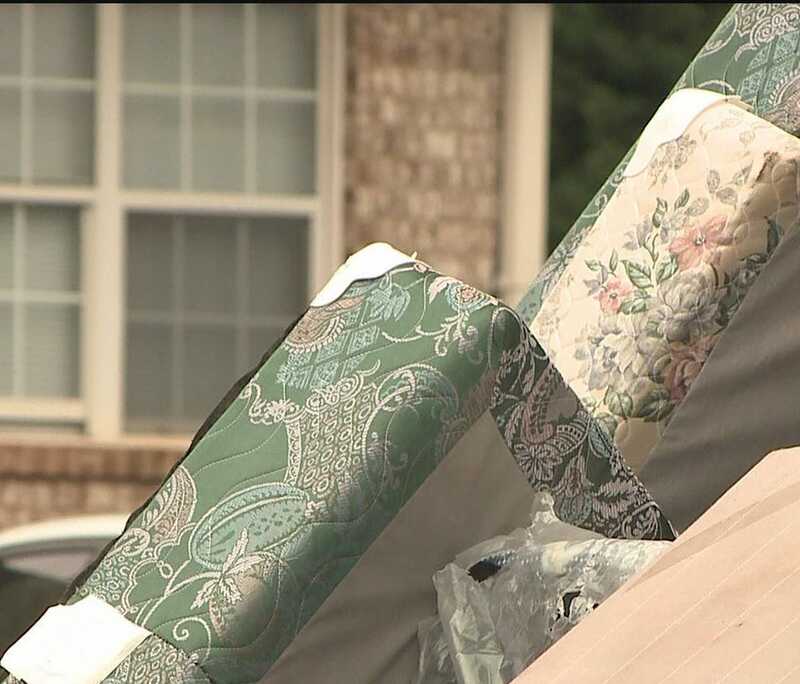 Stephanie Shockley and her two small children woke up every day to sight of trash and tossed furniture outside their townhome. "If I wanted to sit outside and have a cup of coffee, this (trash and discarded furniture) is what I would be looking at," Shockley said. DEKALB COUNTY, Ga. -- A SWAT team was called to a DeKalb County motel after a suspect barricaded himself inside a room Wednesday morning. DeKalb County Police officers initially responded to a shots fired call at Motel 6 at Lawrenceville Highway and Montreal Road. Crews found a window shot out, according to DeKalb County Police spokeswoman Mekka Parish. Investigators determined the suspect fired a shot in his girlfriend's direction. The girlfriend called 911. The SWAT team arrived after the suspect refused to leave his room. He eventually surrendered and was taken to a nearby hospital for treatment for a possible drug overdose; he is expected to recover. Police said he will face an aggravated assault charge; more charges may be pending. The girlfriend was arrested on an unrelated warrant. No names have been released. TUCKER, Ga. -- Police have charged a man after he allegedly left his 9-month-old baby in an unlocked car that was stolen. DeKalb County Police said the child was in the back seat of a car stolen from the front of a Little Caesar's at 3201 Tucker Norcross Road around 10:30 p.m. Saturday night. Police said the girl's father, 28-year-old Jaime Cucum-Macario, left the girl inside the unlocked car while he went inside to get a pizza. The child was located inside the running vehicle around 12:30 a.m. at the Publix shopping center on Shallowford Road. The child has been reunited with her family. She is said to be OK.
Police have not released any info on the suspect in the case. Cucum-Macario has been charged with creating a hazardous or offensive condition, police said on Monday. TUCKER, Ga. – A DeKalb County mother is upset after she says her 11-year-old was injured at a county recreation center. Hilary Logan said she's been bringing her son J.J. to the Tucker Recreation Center for years. But when J.J. hit his head on Tuesday, Hilary said she doesn't know what upset her more: the thought that he may have been playing on faulty equipment, or the fact that she says none of the center's staff seemed concerned. Logan said it wasn't an employee, it but rather fellow parents who called to let her know that her son had injured himself. J.J. was playing, fell in the pit and bumped his head. Hilary said that EMS came only after she demanded that the center call 911. After she arrived and calmed her son, Hilary went to the next room and snapped pictures of the foam pit where her son was playing. She then sent those pictures to 11Alive.